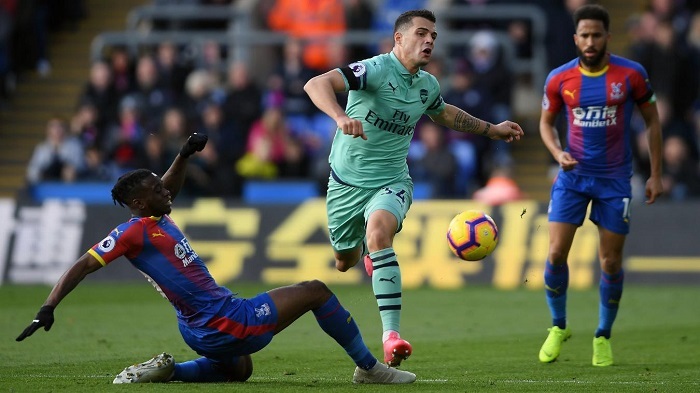 Arsenal played to a 2-2 draw in their Premier League encounter against Crystal Palace on Sunday afternoon. The Palace captain was denied from 12 yards by Jordan Pickford in last weekend’s defeat at Everton but stepped up to put Roy Hodgson’s struggling side in front in first-half stoppage time. The ball was turned Aubameyang’s way when Alexandre Lacazette clearly handled a right-wing corner, meaning there was a sense of justice being done when Xhaka – playing in an unfamiliar left-back roll – crudely brought down Wilfried Zaha and Milivojevic fired past Bernd Leno’s despairing dive.